WIP Monday will probably be postponed until tomorrow. Lots of stuff happening. Guess that’s what happens around the holidays. I’m still going on this, but slowly. Still haven’t finished my dad’s blanket, but I HAVE finished the equivalent of it. NaKNITmo: 24,099 stitches. My goal is 25,740 stitches, so I’m at 93%. I would say something stupid about barring any unforeseen blah blah blah, but I’m superstitious. I’m not about to say something crazy like that, when I’m so close to this goal. The off thing about doing both this month, is that I almost feel like I gained time. Instead of having to divide my time between knitting and writing- it feels like I have ample time to do both. I’ve probably knit MORE this month, than I normally do. I’ve completed twenty-two projects so far this year. That means I AVERAGE two projects a month. I have completed six projects so far this month, with one more that should be finished in a day or two. I didn’t work on these this week. 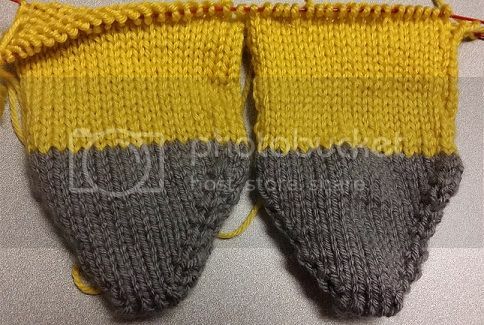 I think I will finish up my inch to the heel (and the heel) after I finish #2. 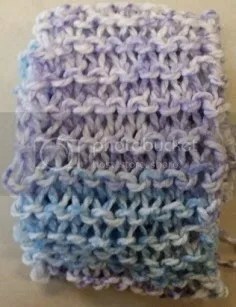 I decided to create a pair of matching purple scarves for my aunt and her two-year-old granddaughter (who she keeps a lot). I have finished the toddler scarf, and I have eight rows to go on the adult one. I didn’t work on this one either, this week. I do technically have a fourth WIP, based on Chevee, but I have a fear. The person I intended to make it for is a lung transplant recipient. And the yarn I was using is the KnitCrate yarn (from o-wool.com), and it is 50% wool and 50% cotton. Now I haven’t seen anything saying that LTRs can’t wear wool, but there ARE restrictions on pet hair and things like that. And the last thing I want to do is make his life any more complicated than it already is; so I’m going to frog it, and make it again in acrylic. I may be overreacting, but it is better to be safe than sorry. And yes, I know I’m behind on my Finished Object spotlights. I will get to all the lovely finished goodies soon. I have been thinking about getting a yarn subscription for awhile. And by awhile- I mean almost two years. I have also been stalking the groups for each of the major ones on Ravelry, and narrowed my choices by going back to the reveals of what was in each box. I counted up how many months I liked and discarded the subscription services I liked the least. I was left with KnitCrate and Yarnbox. Both had at least six boxes out of twelve that I liked each year, plus an option to trade/sell the boxes I didn’t like in Ravelry forums. So I’ve been thinking about this a LOT since it happened to me Sunday before last (November 8th). Hubby and I were at a church meeting, and this boy (he was about 10 years old) sitting across from us asked what I was doing. I told him I was knitting a scarf, and he expressed interest in learning to knit. I of course, invited him to come to the knitting class, when it resumes in the Spring. Then his father sat down at the table. He listened to what I was telling the boy, and then told him he would not be coming to the class. In a nutshell- the dad said that knitting was women’s work (like sewing and cooking- his words, not mine); and that he wanted his boy to be a man and do manly professions (pretty much anything involving grunting and power tools), and playing manly sports, and that he wouldn’t have time for things like knitting. Word Count Monday / WIP Monday! I have tons to do today. Apparently knitting/blogging inspiration has struck. I will try to space them out, so I don’t bombard you with all my thoughts at once, but I have to write a review, do some FO spotlights, speak on misogyny, and drool at Knit Pick’s sale that started today! Seriously- bookmark this page and visit it EVERY DAY this week. This one is for my mother-in-law, who is apparently a huge University of Tennessee fan, so she probably wouldn’t mind getting an eye-searing orange scarf. But- as I’m supposed to knit her something for Christmas- this is it. So I am in fact doing Christmas knitting. It looks like crap right now, but that’s usual for this scarf. It shapes right up once it’s off the needles and blocked. I am on row 14 of the chart. And I forgot to bring it along, so I could get a picture of it. Sorry about that. and the sleeves of my cable hoodie. I also have to make a child’s necklace sometime this week. All pink, or pink and red was requested. This should be a quickie project, so I’m not worried. And as always happens when I knit in public- a blanket has been requested (with no deadline) by a very TALL, very beloved person at my church. He and his family are awesome. They are always ready with a hug and a kind word, they love our baked goods, and all of them are knitworthy. So he gets a blanket. I asked him what color, and he said whatever color(s) I want to make it. Wow. That’s free reign to do WHATEVER I WANT! I am currently at 14,375, which is above the anticipated goal of 13,336. My plot is kind of fizzling, though; so I have moved on to something else, until inspiration strikes. So I’m going to have to restart my dad’s blanket. This will be the second restart, and oddly- NEITHER have anything to do with tv knitting. (Some people say they can’t knit and watch tv, because they will make tons of mistakes. But I’ve had no problems thus far.) I’ve been mostly knitting on it at work. And apparently I’ve been distracted enough to drop stitches (the reason for the first restart), and to skip a whole section of the chart (the reason for this restart). And all of this on breaks and lunch. Maybe I need to START watching tv, because obviously- I’m not distracted enough to focus. In other news- I completed another Charity Scarf. I’m trying to use up the various skeins of miscellaneous yarn that I bought on a whim. Most of this stuff I’ll never use for me. Not because I don’t like it, but because I have a lot of one skein purchases (that don’t particular match anything else in my stash), and I’m trying to get into multi-skein projects. This scarf is exactly the same as the Hockey Scarf, only I knit it on US size 19s, instead of US size 11s. So I used less yarn. I doubt that I will have enough yarn left over for a FULL third scarf. 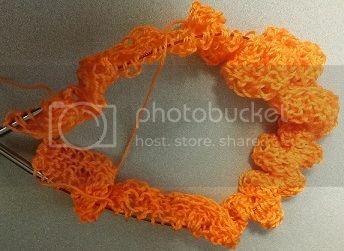 Maybe I’ll do a toddler/child’s scarf. There’s enough left over for that. I originally posted this on Facebook a few years ago. This is a commentary on inflation and the cost of living in the U.S.